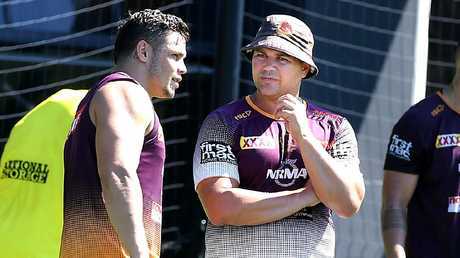 Broncos coach Anthony Seibold maintained a search for high standards of fitness and discipline with a 35C, early afternoon training session Sunday tracking towards Thursday's clash with the Dragons. Eager to draw more from his team after momentum was established in a 29-10 win over North Queensland last Friday, Seibold was not enticed by forecast steam bath conditions to order the field session to take place earlier or later. The 1pm start time for a one-hour session came about because Seibold wanted to give the players a morning off during their six-day turnaround. Since late in the preseason, the Broncos have trained on the field at 9.30am this year, Seibold's first, and Wayne Bennett invariably scheduled morning sessions on his watch. 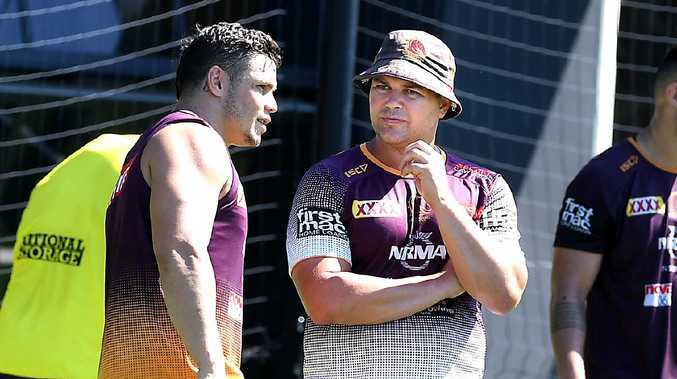 Seibold had the Broncos train in the heat. AAP image, John Gass. "We need to back up that effort (against the Cowboys) - we are going to put that game to bed and really concentrate on the Dragons because they are going to be coming,'' Broncos forward Shaun Fensom said. After an hour's training, the players had to complete a weights session before going home. "I haven't heard of a Broncos team training then (1pm the season is up and going,'' former Broncos premiership forward Mark Hohn said. "I really rate Wayne Bennett as a coach and I'm fast learning about Seibs as a coach. It seems a change of scenery has been good for some of the players. "The Broncos play an up tempo game, which I hear the players saying is what they believe is one of their strengths, that they can play at speed for 80 minutes. "The way they have trained in the pre-season, is according to the players, a lot harder than they trained last pre-season. It's exciting that they are doing this without some old heads I thought they would miss, like Josh McGuire. 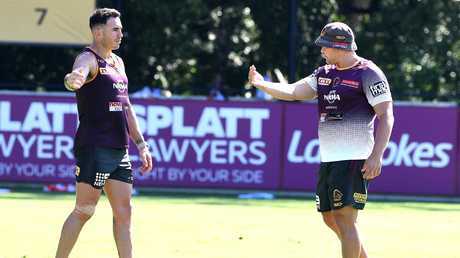 Seibold and Darius Boyd at training. AAP image, John Gass. Broncos centre James Roberts said he had not suffered a recurrence of back spasms after his two-try evening against the Cowboys. Roberts said there was no question of Thursday's home match against the Dragons being a form of revenge for a 48-18 loss to St George Illawarra will eliminated his side from the finals in September. "It's disappointing to go out like that, but it's a new year and a new coach,'' he said. Roberts said teammates Tevita Pangai Jnr and Jack Bird were capable of joining him in the NSW Origin team this year. "He (Pangai) is a special talent. Hopefully he does get a Blues jersey,'' Roberts said.